My build thread is rife with a lack of details and specifics, and my short S&T article mostly discusses my smaller 6” scope, so I thought I would write a nice, lengthy article for here on my big scope, as well as how and why I built it. This isn’t a “how to” article – most of you whom are more competent woodworkers than I am could at the very least sand and stain your scope more evenly, let alone improve upon the design. However, if you’re new to telescope making or just looking at this article, I hope it encourages you that building a telescope of this size is within your grasp. Why build a big Dobsonian? For the longest time – about two years -, I was happy with a small scope. I started out with a couple of small Maksutovs, then grew into an 8” SCT and some 6” Newtonians, the last of which I made myself. I was content with hunting down the Messiers and bright NGCs from my yard and using larger scopes at observatories or star parties. I did outreach on the sidewalk and at club events with these scopes, too. · People want to see deep-sky objects! For personal use, a 16” scope puts within range many things that an observer with a smaller scope could never consider – individual HII regions in galaxies, moons of Jupiter besides the Galileans, detail on the Galilean moons, full resolution of even dim globular clusters, Uranus’ moons, and Pluto - even in the suburbs. One can now browse the Coma and other galaxy clusters besides Virgo and see over a dozen galaxies in one field outside Markarian’s Chain, easily view Stephan’s Quintet, and see obvious color in most planetary nebulae. The brightest deep-sky objects begin to resemble the photographs. There is no other scope that is as versatile and portable as a homemade truss Dob at large apertures. A C14 is barely manageable and transportable by one person, has a ridiculously long focal length (and thus a rather small field), costs thousands of dollars, and then needs a massive, heavy equatorial mount costing several thousand additional dollars. The only other scope that could really match a big Dob at a remotely reasonable price would probably be a custom Cassegrain or corrected Dall-Kirkham, which again suffers from the transport/mounting issues as well as a very narrow field of view. Even if I could’ve afforded a Chinese truss Dob at the time of making this scope, would I have bought one? Heck no! The steel tubes and particle board bases of the Meade and Sky-Watcher Dobsonians lead to them weighing between 125 and nearly 200 pounds, and the latter scopes are not true trusses and thus not very compact even when collapsed. The Explore Scientific 16”, at 88 pounds, is still over a full ten pounds heavier than my scope, lacks an easy way to line the UTA to block stray light, and has issues with the friction of the laminate. I admire those who tinker with extremely expensive and complicated homemade Dobsonians. But if your goal is merely to see the universe for yourself and show it to others, build your scope cheap, simple, and well. I have seen newbies heavily discouraged out of building a big scope, and I suspect that one of the most read guides on building truss Dobs (which was co-written by a major vendor, after all) is probably meant to make telescope making seem like a too-complicated process – it recommends avoiding making the mirror at all costs, using a half-dozen different types of wood, only using thick Pyrex mirrors, etc. – could you imagine John Dobson or any of the early Sidewalk Astronomers’ scopes being like this? As of the time of writing this article, I’m fifteen. To my knowledge, nobody under the age of 20 has ever made a scope this big – the largest I have heard about is a 10.5”, and I have a friend who is working on a 12.5” mirror and scope, but I have never seen a 16”. I would love to see amateur telescope making thrive again and for someone my age to build an equal or bigger scope than mine. I built the entire 16” scope as described here on my garage floor using a simple circular saw, router and circle jig, electric drill, and some simple hand tools available for less than $50 total, using a sheet of ¾” plywood as well as some ½” plywood and 1” circular wooden dowel. To go and duplicate what I did (including my mistakes) would cost about $1500, but if you can make your own mirror well with 1” thick plate glass and source some parts more economically than I knew to at the time, you could probably bring the cost down to $1000. That’s certainly a lot cheaper than a commercial 16” – even if you’ve built an entire scope and made a 6-8” mirror before, you’ll still be saving money over buying a commercial 16”! This was my second-ever woodworking project (the first being my 6” scope), and I come from a family with very little knowledge of hands-on work with power tools and wood. Originally, I had planned on grinding a 12” x 1” plate glass blank obtained in a group buy from Swift Glass here on Cloudy Nights and making a scope out of that. I had ground the mirror out with #60 grit to about f/7 back in January when an interesting Craigslist ad appeared: A $150 homemade 8” Dobsonian with a 16” x 1” plate glass mirror blank thrown in. As we get a good astronomy deal on Craigslist around here only once about every 3 months, I jumped. I immediately sold the 12” blank to a friend, poured a gigantic pitch lap, and went to work on refiguring the 16” primary. The guy had never made a mirror before it (he had dropped his 8” on the ground during fine grinding) and had no clue how to figure it, having left significant astigmatism and overcorrection. He also had a mirror grinding machine which he ended up selling to one of the Stellafane organizers a month or two later. Rather than leave you all on a cliffhanger, I’m just going to state what happened to the 16” mirror – I failed. It’s only an inch thick and I neglected to support it on a carpet or anything while I worked, so I ended up exchanging most of the astigmatism for a bunch of zonal errors. In addition, my pitch lap was too hard, and the base was so heavy that it was probably warping the mirror underneath it. It did have okay overall correction, though. I traded it to the same friend who bought the 12” for a nice, 1/8 wave peak-to-valley 16” f/4.8 primary, also 1” thick plate glass. If you’ve made a 6” or 8” primary successfully before, have some guidance, and don’t make the mistakes I did, I think you can pull off a 16” x 1” plate glass primary of any focal ratio above f/4. To source your own blank, you could look used here on CN or AstroMart, or alternatively get a blank from Swift Glass. If you can get a few friends to join in, 16” x 1” plate glass blanks are about $125 each for a group buy of five or more – otherwise they’re about $200. (Note: I do not have any kind of association with Swift Glass, but I haven’t found any sources of large/cheap 1” thick plate glass blanks besides them). The mirror cell is arguably the part of the telescope that is usually the most difficult to build. Not so for me, and it shouldn’t be for anyone. Most mirrors under about 20” or so in aperture with any sane thickness ratio (1:16 or thicker) can get away with a 6-point floatation cell. This is something that some on CN have discovered from playing around with the mirror cell design tool PLOP. My 16” deforms by about 1/25 of a wave total from its mirror cell, which one will never detect. Because the mirror in my scope is so thin and I keep it in the garage, I opted to use a simple plywood “tailgate” like Dobson himself did and made the floatation support out of 3 wooden rectangles glued to a piece of flexible plastic (obtained from cutting a piece out of my brother’s 3rd grade English folder), with 3 ¼ 20 screws at the back to adjust collimation – you could substitute these for hand nuts but I worry about little kids/curious adults messing with the collimation. There are three ventilation holes at the back, which I may add fans to in the winter. The mirror rests horizontally on an old belt and is prevented from falling forward by two metal corner braces with felt pads on them. I have Velcroed the mirror to the belt to prevent severe misalignment during transport. The mirror secures shut by tightening two screws into T-nuts at the back, with a hasp for safety. If you don’t mind the cost of a custom mirror cell or want to weld one yourself, feel free to do so. But if you’re trying to save money and don’t have access to a foundry, I recommend the hinged-tailgate design. My mirror box is extremely simple – just a 19.5” cube (with the tailgate attached) of ¾” plywood nailed together at the joints, painted flat black on the inside. The outside is stained and is varnished with polyurethane. A few handles are attached to allow for ease of carrying, as the mirror box weighs about 55 lbs. with the mirror in it. Pretty much every truss Dob you see uses circular poles. However, as with any engineering choice, one must ask exactly why it’s done. The answer, in my opinion, anyway, is that there isn’t really a good reason for the preference towards circular poles. Unless one spends a few hundred dollars or machines premium clamps, circular truss poles aren’t that easy nor intuitive to attach – the easiest method is crushing the poles at the ends and putting screws through them, which looks bad, decreases structural stability, and often results in hardware falling on the primary mirror. A square pole can be attached without crushing the tube at the end or resorting to clamps via a simple hand knob and bolt, and it’s going to be clad in a foam tube anyway, so it’s not an eyesore. Furthermore, if you can find a good local dump or electrician, you may be able to obtain square pole material for free. I used 1” thick aluminum poles ordered off the Internet, but after the completion of this project I realized that they are available from Home Depot for much less. You could probably get away with ¾” poles with a 16” or smaller scope, but I found 1” easier to work with. To drill the holes, mark the location and center punch it (center punches are about $5), and then drill using a regular bit. The poles attach to the mirror box via a simple ¼ 20 bolt through each end of the pole with a hand knob to secure it. Total cost: about $1.50 per pole. The truss poles are lined with foam pipe insulation (swimming noodles work as a substitute), which prevents reflections off the poles and makes them more comfortable to grip. To my knowledge, there are only a handful of other scopes out there using square truss poles. Obviously, when you have a lightweight primary mirror and you want your scope to be as lightweight and portable as possible, you need a lightweight upper cage too. My UTA is made from two ½” plywood rings, three 1” dowel struts, and ¾” plywood for the focuser board and truss attachment blocks. I originally used a GSO dual-speed Crayford but switched to a Moonlite after being given the latter. Complete with the spider, focuser, craft foam liner, and secondary mirror, it weighs only 4 pounds. The UTA is lined with craft foam to keep stray light out. It works quite well, weighs nothing, and is available anywhere for about a dollar. I would recommend using ¾” plywood for the rings. I didn’t, and if they are grabbed tightly they can flex a little, which, while unnerving, doesn’t affect the views. It will only add a few ounces to the UTA’s weight. I drilled a small hole in the lower ring and attached a Rigel Quikfinder base, as it is my preferred finder/sight, but for a Telrad or full-sized finderscope one could easily attach an extra board similar to the focuser board to mount it. I ordered a spider from AstroSystems, but it took so long that I ended up making one myself. It’s very simple in design and the vanes are made of some brass stock I found on eBay which cost me a few dollars. I cut the brass with scissors. I didn’t bother to paint my spider vanes as they sit above the UTA and don’t cause any kind of reflections, but your preference may vary. Curved vane spiders spread out the diffraction pattern rather than turn it into spikes, decreasing contrast. I recommend making or buying a straight-vane spider. My own homemade design shows spikes only on stars brighter than magnitude 2 or 3, and at medium to high power none of the planets except Venus show any kind of spikes. I used a 70mm GSO secondary mirror. I have absolutely no complaints as to its optical quality, and it provides just a 17% central obstruction by diameter, delivering excellent contrast. For my rocker and altitude bearings, I used ¾” plywood for the entire construction. Many would advise to use thicker wood than this or to use layers of plywood, but if the joints are done correctly it will not flex. I cut the 25” circle for the bearings with a regular plunge router and circle cutting jig, then sawed that in half. If you’re wondering how I attached my truss poles with standard plywood bearings, it’s simple. I just drilled ¼” holes where the bottoms of the poles mount, and the poles had enough “give” that bending outwards by ¾” was not a problem. 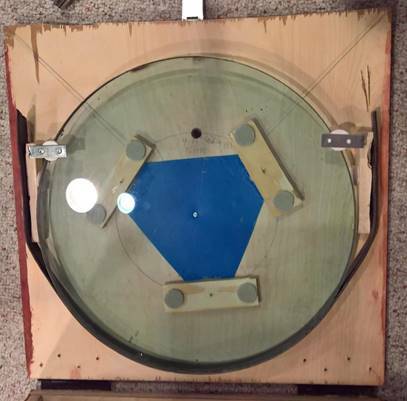 The ground board is made of a 1” pine circle with ¾” plywood disks about 2.5” in diameter acting as feet. Remember the damaged 8” f/6 from earlier? I scavenged the Teflon pads from it to use for my scope. For the laminate, I bought a sheet of crystal-textured beige Formica at Lowes. The altitude bearings only protrude slightly from the front of the rocker box. This would be normal with a thick primary, but my 16” primary weighs only 17 lbs. As a result, one needs a counterweight to keep the bearings at a sane position (if they protruded further the mirror box would not fit in the back of most cars), which brings me to the next section…. Obviously, some kind of counterweight is needed with a thin mirror to keep the mirror box as compact as possible. While one could stuff lead bags into the corners of the mirror box as well as add weight to the mirror box’s rear, this proves unwieldy and imperfect. My solution was to use a chain. Some Dob users swear by these to allow for changing eyepieces without their scope dipping towards the horizon or suddenly swinging towards the zenith. I found that a chain attached to one of the carry handles on my scope was sufficient to balance the top-heaviness. Unlike regular lead counterweights for the back of a scope, a chain is less likely to break your toe if dropped (a problem for solid weights), is cheap (unlike lead bags), and it keeps the scope in place when changing eyepieces. Thus, I highly recommend one. I initially used a black sheet from a bed for my scope’s light shroud, pinned with a binder clip on the bottom. This works fine, but the sheet is a little small for the scope and has begun to form a large hole which worsens each time it is used. Thus, I will probably replace it with a proper Lycra shroud soon. If you live under mildly dark skies and don’t worry about the Moon shining through your OTA (i.e. you’ve baffled your mirror box, unlike me), you can probably omit the shroud. For my dust cover, I cut a plywood square a hair bigger than the inside diameter of the mirror box (17.5”) and threaded bolts into the corners to keep it secure, then added a handle to the middle. I can remove/attach the dust cover easily regardless of whether the truss poles are attached. I stained the scope with Minwax Sedona Red wood stain. It came out in an even coat everywhere except on the bottom of the mirror box and part of the rocker box. I would recommend using pre-stain conditioner if you want it to be perfect. I then varnished the scope with Minwax spray-on polyurethane. I’m a tall guy, but I’m not very strong. Still, with practice I am now able to set up or take down the scope in about 10 minutes with no help whatsoever. It’s nice to have assistance in setting the mirror box/base down on the ground safely and attaching the UTA, but it’s not strictly necessary either. The scope fits in the back of some SUVs without folding down the seats if one places the UTA in the back seat and lays the truss poles on the floor. In many cars, however, the height of the mirror box forces one to fold down at least one of the back seats. If you have even a small minivan, however, I would not worry about a lack of space for bringing camping gear and additional people to dark skies. I store the scope dismantled in my garage. Regardless of temperatures, the mirror has already cooled down by the time I have the scope assembled. I recently had to leave the scope in a very hot car all day (it was 95 degrees outside) and set it up about an hour and a half before sunset, and it still cooled before sunset allowing for some great views of the Moon even in broad daylight. And this is with no fans whatsoever! So even if you store your scope indoors, don’t fret about cooldown – if it really bothers you, just install some fans. At f/4.8, there is coma with low-power eyepieces. I’m not really that bothered by it with my 20mm Meade UWA, but I am probably going to obtain a Paracorr soon to allow for perfect edge sharpness with wider-field eyepieces in the future. As for what you can observe with a 16”, I’m just going to list everything. ·The Moon – Regardless of phase, you will never get bored here. Craters like Theophilus, Aristillus, and the like show tiny craterlets. Central peaks are not just dots – they’re obvious mountains. Tiny fault lines and ridges are visible pretty much anywhere there is remotely flat terrain. Craters down to about 1 km in diameter become visible with good seeing. ·Jupiter – There are many irregularities and mottling easily visible in the equatorial belts. The Great Red Spot shows detail within its center. Ganymede is a brownish disk with some albedo features. ·Venus – Featureless as always, just blindingly bright. I may try a violet filter to look for cloud features sometime. I have yet to get a good look at Mars with this scope, and due to the now planet-wide dust storm I probably won’t for a while. I will post on Saturn, Uranus, and Neptune as soon as I can. ·M3 – Absurdly bright with full resolution. Can use extremely high power without much dimming. Some color in the brightest stars. ·M5 – Resolved and looks like a small open cluster at low power but fades quickly with increasing magnification. ·M10 – Full resolution to the center, many outlying stars, similar to how M11 looks in a small scope. ·M13 – “Propeller” dust lane is extremely bright if you know where to look for it. Full resolution with some colored stars. Nearby NGC 6207 is obvious with a bit of detail. ·M14 – One of the densest globular clusters in the Milky Way, and completely unresolved. Extremely bright and large, but no stars. ·M53 - As one of the more distant globulars from the Solar System, this cluster can only be partially resolved. Still excellent and quite bright, however. ·M92 – Full resolution and obviously not perfectly round. ·NGC 6366 – Faint averted vision blob when glare from nearby 4.5-magnitude star is blocked. I’m not big into planetary nebulae. M57 is easily visible even in twilight and has irregular structure like the photographs, while the Blinking Planetary is extremely bright and green. M35 and M38 look excellent in the 16”, with most of the stars showing colors. ·M63 – Little to no detail, but rather bright. This galaxy suffers severely from light pollution. ·M83 – Too low in the sky and directly towards NYC at culmination to see anything but a tiny blob barely contrasting against the skyglow. ·M94 – Ridiculously bright. No detail whatsoever. ·M95/96 – Bright, but both lack detail. ·M102 – Very bright and looked great. One of my favorite galaxies. ·M105 Group – All three galaxies visible, but no detail (the bright two are ellipticals, while the third is too faint). ·M108 – Mottling and irregular dust lanes extremely obvious, looks like the photographs. ·HCG 44 – All 4 galaxies visible (three just barely show in my 6”). NGC 3190 shows a dust lane. ·NGC 3226/7 – A nice interacting pair with little to no detail. ·NGC 4490/85 – Another interacting pair. While there are no dust lanes/spiral arms to be seen, both galaxies show off their highly irregular shapes. ·M51 – Spiral arms jump out at you like in the pictures. Many HII regions are visible. ·Leo Triplet – M65 shows a dust lane and M66 shows some irregularities. NGC 3628 is highly elongated and irregular. ·M81 – Spiral arm visible. ·M82 – So many filaments and irregularities I can’t even count them. Extremely bright and looks just like the pictures except for the dust lanes fanning out from the disk (obviously invisible in my scope). If you have any doubt that you can see all of what I’ve just described yourself, I would like to point out that I have observed with my scope only six times, and many of the deep-sky objects I’ve shown to others (such as M51) are extremely impressive even to those who have never looked through a telescope before. 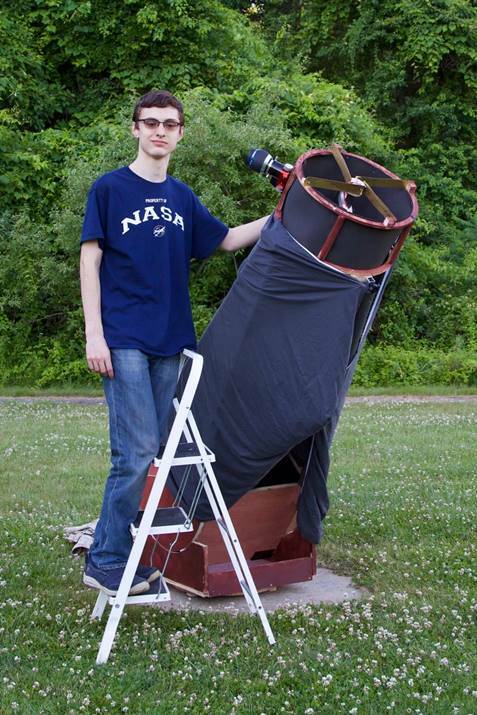 Constructing an owning a large-aperture Dobsonian doesn’t have to be expensive. It doesn’t have to be complicated. It doesn’t have to be heavy or hard to transport and set up. After all, thin plate glass mirrors, cheap and easy construction, and ease of transport/setup are what defined the original Dobsonian – who says these features can’t define the modern one? A big scope with a good mirror will always outperform a smaller instrument, even under significant light pollution. All other things being (at least somewhat) equal, nothing beats aperture, regardless of how bright your skies are. As I said in the beginning, I hope that this article has encouraged you to at least think about building a big Dob, and I’m always around on the CN ATM forum if you need help. Very worthwhile article. Very practical which is particularly excellent! I really enjoyed your article! Thanks for posting! Wonderful article. Thanks for the well written ideas, thoughts, and practical advice on how to build a big dob. Waiting on craigslist to deliver my big mirror so I can begin. Kudos to you for not only a fine and inspirational article, but also a great scope. I'm sure John Dobson is smiling. As a similarly unskilled wood worker with the same few tools as you (as described in my article back at the end of 2016) I have very much been enjoying my scope as well as you seem to be enjoying yours. However, I am already developing a case of aperture fever and thinking of moving up from a 12 1/2" to a 16". 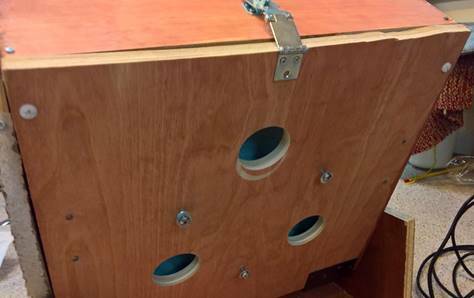 I enjoyed your article and like many of your money saving ideas but wish you would have provided a few more close-up photos, especially some of the details of the square truss tubes and how you attach them, both at the top of the UTA and at the bottom and how the entire UTA attaches to the mirror box. I love it! As for my story, my original 16-inch I made for $250 and finished it in 1987. It's an f/6.4 and I found the disc in a junkyard in Spain. At first I could see it was some kind of optical flat. I tried to sell it by writing to every telescope company in the states. I wrote every one of them that advertised in Sky & Telescope and what did I get? Three catalogs! That was it. So, I decided I wanted a mirror more than hassling with a bunch of no responses, though I'm sure I could've probably bought a much larger finished mirror with what that optical flat might've been worth if it was of any quality. I never found out because I started hogging it out. It took two years, I got it down to f/6.4, which is where I figured I'd better stop because the blank is 1 1/4-inches thick. I made the rest of the Dob out of junk, literally. It's gone through many iterations over the decades and now sits in my back yard under a tarp, for sale because it's nine feet long and I use a commercial truss scope that's just easier to move around. However, I really admire that you did a similar thing. Congrats! Nice article Zane. Well written and informative. Can't wait to see what you build next. I'd be very interested in getting that much aperture for under $2000, and my father has both experience and tools from 30 years of building homes and decks that could help make this happen. Some more pictures and maybe some basic measurements would help immensely. Great job! Nice work! And weirdly, you appear to have exactly the same ladder I have!!!! Great article and awesome scope, Zane. I followed your build from start to finish. What you accomplished in the amount of time is not only impressive but encouraging. Not many amateur astronomers own a 16in Dob, let alone a truss Dob. Now throw in that you designed the telescope yourself. Cut out and made all of the components with the most basic power and hand tools. Assembled it all on your own and did this all on your garage floor is more than can be said by most. Yes, you had a setback. So what, don't so many of us that attempt something ambitious. Or those of us that try something for the first time no matter how many hours researching the project. No matter how many questions we may ask. Things do and will happen. Even to people with years of experience. What's important is you learn from it. Now you know what to do and what not to do. The end result is that you have a great scope. You asked the right people for advise when you needed to and listened to them. You learned a few tricks and tips along the way. What stood out to me was that you didn't get discouraged and change your plan or quit all together. When the naysayers chimed in you just kept on moving forward. Now I cant speak for others, but I can speak for myself and I say this is all quite an accomplishment for anyone to achieve. I sincerely hope amateur astronomers and potential amateurs no matter the experience level or age will see what you have achieved and realize that they can view the wonders of the night sky with a large aperture scope. It doesn't have to cost thousands of dollars. A person who is thinking of going the ATM rout to achieve owning their dream scope can. All it takes is some basic hand and power tools. Asking a few knowledgeable folks questions. Keeping a can do attitude and a bit of perseverance and you'll achieve the scope you want. Congratulations on what you have accomplished. What you have achieved is exactly the boost that this hobby is in need of. Especially with the amount of talent and ideas that is possessed by people under the age of 25. I hope your story inspires people into the ATM world and to look up at night and explore. Nice article, Zane... thanks for sharing! I need to stop doodling designs and get on and build my 22 inch f4.6! There is hope for the next generations to come. I have to agree with everything AllanBarth1 said above. He is spot on. Build a Dob? Well I have never even looked through one yet but I will. Keep up the good work. And thanks for continuing to do outreach and encouraging and educating the young folks here in Connecticut. Good luck and have fun at Stellafane. That is one very well written article, and a fine piece of telescope building. I'm not a particularly good craftsman when it comes to building things from scratch, but this article has convinced me that it is worth a shot. John Dobson is surely smiling at your results. Thank you Zane for building and writing about this scope. It is also refreshing to see someone your age interested in not only astronomy, but BYO equipment. Keep it up! to overcoming problems encountered during the build. 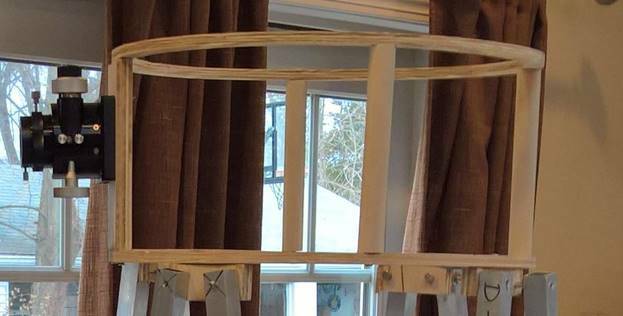 I am working on a 12 inch truss dob. First I am working on a 4.25 inch mini truss to work out bugs on a small scale. The Sidewalk Astronomer himself is likely smiling!! I watched his video of making a Dob using a tailgate style box and using simple wood shake wedges to hold the secondary mirror in place with friction. Use what you have. Get the photons to your retina!! I wish you lived closer and I would give you access to my hobby shop! My truss 12" started out as a "prototype" that became permanent. FYI. I did a 4 truss setup with traditional round poles. Found a little to much flex in the system (think rectangle deforming to parrollellogram). I fixed it by using cheap bicycle brake cables from the bike shop. I drilled a small hole in the UTA end of the pole and slid the cable through. The other end was attached using a simple threaded turnbuckle and attached to the bottom of the parrallel pole at the box side. I then did the same for the second pole on the same side thus creating an "x" of thin cable. A little tightening and the "X" locks that rectangle into a very stiff segment with no more flexion. Saw you article in Sky and Telescope. Was a really good write up. Congrats! I enjoyed your article. The art of using your skills and imagination to make something out of nothing is divine work. I wish my astronomy club had a couple of young visionary men like you. "I suspect that one of the most read guides on building truss Dobs (which was co-written by a major vendor, after all)". I am wondering which book you are referring to?